Today is a busy day, for sure. I have to pack some clothes and other things I’ll need for my stay overnight at the Westin Hotel in Charlotte, NC, then head to Greensboro for my presentation on the Soulforce Equality Ride at the General Assembly of the state-wide UNC Association of Student Governments. After that, I head down to Charlotte, NC, with my good friend and colleague Chris Cannon for the 2007 Human Rights Campaign Carolinas Gala at the Charlotte Convention Center. We’ll leave around 1:30pm and get to the hotel by 3pm (I certainly hope we’ll be settled no later than 4:00pm). I’ll have some time to take a shower and get dressed in my fancy, cool tuxedo and then head to a news interview outside the convention center at 5:30 (if it doesn’t get canceled). After all that, I’ll finally get to go inside the convention center, check in to the Gala’s registration desk and schmooze for an hour before dinner is served and the program begins. I think Chris and I have plans to go out on the town after the Gala. Either that or will hit up one of the free after-parties either in the convention center or the hotel. I’ll then be back to Winston on Sunday. I’ll have my computer with me and I’ll surely be taking plenty of photos, but don’t expect me to be replying to any emails at least until Sunday evening or Monday. NOTE (02/11/2007 1:15am): The video below was only a preview of a more in-depth, well-researched and presented video. After learning of some very important and interesting information regarding the adoption of a completely new constitution for UNCASG, the focus of the video will be changing a bit. The interviews in the video preview below may or may not be included in the final video version. Many of you may remember, especially after I included it in the 2006 wrap-up, the big controversy surrounding a proposal in The University of North Carolina Association of Students Governments back in April 2006. UNCASG is the state-wide student government and student advocacy organization representing each of the 16 UNC campuses and over 200,000 students. The group is entirely student-run and directed and funded directly from fees collected from each and every UNC System student. The April 2006 proposal brought to UNCASG’s General Assembly was presented by me and was primarily a proposal arising from the UNCG Student Government Association. The proposal would have amended UNCASG’s constitutional Equal Opportunity Clause to include sexual orientation, gender, gender-identity/expression and socio-economic status. Of course, the majority of the debate centered around sexual orientation. A couple of days ago I was finally able to buy my digital video camera and I got the editing software from Sony to go with it. Here is the a preview of the first video I’m committing myself to making. The video offers some more detail on the proposal and has some short comments from students and how they feel about the proposal. When the video is done, I hope to have something that can be used to help motivate students at each of the 16 campuses to urge UNCASG to push for this Equal Opportunity Clause change. Watch the preview… more details coming later with the full video (as soon as it is done). 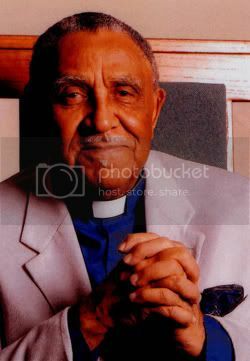 The Reverend Doctor Joseph Lowery, often referred to as the “Dean” of the Civil Rights Movement, was the keynote speaker at UNCG’s 21st annual Martin Luther King, Jr. Celebration on Wednesday, January 17, 2007. The audio recording above, including both the Reverend Joseph Lowery’s speech and the Question and Answer period runs at approximately 1 hour and 2 minutes and is no where near 100% professional. While it is hard to hear him, at times, I tried to do the best I could in getting it (I was sitting in the middle of the audience and sometimes the laughter is just to the point of being louder than him). If you like or if no embedded audio player appears above, Click here to listen or right click and “Save Link As” or “Save Target As” to download and save to your computer. The Reverend was amazing. His speech really can’t be classified as anything but the classic, moving and aw-inspiring sermon of a deeply humanitarian, loving and compassionate Southern, African-American Preacher. In much the same way as one applies medicine to the “affected area” of the human body, the Reverend said, we should “apply Martin’s healing salve to the ‘affected areas’ of the ‘body politic’ and life” in the United States. International Relations – At 85 years old, the Reverend readily admitted that he was the oldest person in the room. He said that in his entire life he had never seen America’s state of international relations in as bad a shape as it is now. He discussed Bush and his foreign policy, the invasion of Iraq, the occupation of Iraq and more. The Reverend said that our International Relations needed improvement and this was one of the most important areas needing quick attention and care. The Oneness of the Human Family – Black, white, red, yellow or pokadotted or green, The Reverend stressed the importance of living as one human family, offering up to one another true and mutual respect and honoring each other’s inherit dignity and worth. Economic Justice – How vulger, vile and obscene, said the Reverend, it is that a handful of people have way more than they should ever need, while so many, countless numbers of people have way less than they always need. He pointed to a study from Sweden analyzing and comparing the ratios between what employees and workers earn to that of what CEOs and top-level management earns and what, in reality, the ratio should actually be. According to the Reverend, CEOs and other top-level staffers should be receiving on 6-7 times more than workers and employees. The truth, he said, was that in American CEOs earn sometimes as much as 300 times more as workers (and with added bonuses, benefits and “severence packages” sometimes as much as 500 times more). He urged all of those in the room to push for economic justice and to challenge America to re-think the position in which it currently finds itself economically. The Reverend also pointed to a study which sought to find the richest and poorest counties within the United States. According to the Reverend, 80% of the poorest counties in the nation belonged to the South; he gave three reasons for why this was so: 1) Low wages. 2) Racism. 3) Lack of quality public education. Opportunities in Education – From his last point made in discussing Economic Justice, the Reverend stressed the extreme importance of quality public education for all people. He said the South has always had a bad track record when it comes to prioritizing funding and support for good and sound public education. He listed the lack of quality education opportunities as one of the most dire and serious problems facing America today. In discussing education, the Reverend also discussed Affirmative Action, warning us all not to let the true definition of Affirmative Action be hijacked and twisted for political gain. He said that Affirmative Action is NOT reverse discrimination or preferential treatment, but rather an intentional “closing of the gap.” He reminded those in the room that the gaps and inequites weren’t made by accident… that they were intentionally created through public policy, law and private actions. Much like the gaps and inequities were created intentionally, he persisted that they must be rolled back and done away with intentionally. The Criminal Justice System – The Reverend related back to his home State of Georgia, saying that while African-Americans constituted no more than 30% of the general population, they accounted for more than 66% of those persons incarcerated within the criminal justice system. The Reverend said that the problem is not that black people commit more crimes, but rather that racism, whether we like to admit it or not, still plays a part in how African-Americans are viewed by the legal system and the authorities. He also added that inequities existed not only between how laws are written and enforced for different people, but also that many black people being unable to afford legal representation often take “deals” just to get out of more, possible jail-time (even if they may be innocent of the actual crime). “Weapons of Self-Destruction” – In his final key area, the Reverend included both ignorance & complacency, and sexual irresponsibility, as well as drug and substance abuse and addiction. He said it’s just fine and dandy to know about JayZ or Beyonce, but he asked, “What else do you know?” He also warned against “babies having babies” and the dangers of taking on adult privileges when one is not yet ready to take on adult responsibilities. The Reverend also responded to a student’s question regarding Presidential candidate Barack Obama. Although the Reverend didn’t comment on whether or not he thought Obama was good for the job, he did say he knew Obama’s pastor, planned on meeting his pastor and that he thinks he is a “very impressive young man,” hopes Obama is grounded in truth and thinks that one reason why he has become so popular and that people are “so attracted to him in this moment in history” is because the American people are so sick and tired of the bickering taking place in politics today and Obama seems to represent a “breath of fresh air” and a sense of “reconciliation.” He added that the “jury is still out” on whether Obama could make it to the Presidency. I hope that you will cherish the Reverend’s message and, well… to be honest, the Reverend’s sermon, just as much as I did. 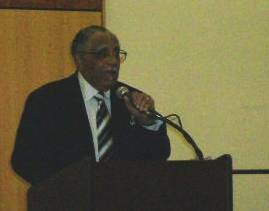 The Reverend Joseph Lowery, outspoken civil rights activist, will be the keynote speaker in 2007. He was born on October 6, 1921, in Huntsville, Alabama. Considered the dean of the civil rights movement, Lowery began his education in Huntsville, spending his middle school years in Chicago before returning to Huntsville to complete high school. From there, he attended Knoxville College, Payne College and Theological Seminary, and the Chicago Ecumenical Institute. Lowery earned his doctorate of divinity as well. Lowery began his work with civil rights in the early 1950s in Mobile, Alabama, where he headed the Alabama Civic Affairs Association, an organization devoted to the desegregation of buses and public places. During this time, the state of Alabama sued Lowery, along with several other prominent ministers, on charges of libel, seizing his property. The Supreme Court sided with the ministers, and Lowery’s seized property was returned. In 1957, Lowery and Dr. Martin Luther King, Jr. formed the Southern Christian Leadership Conference (SCLC), and Lowery was named vice president. In 1965, he was named chairman of the delegation to take demands of the Selma to Montgomery March to Alabama’s governor at the time, George Wallace. Lowery is a co-founder and former president of the Black Leadership Forum, a consortium of black advocacy groups. The Forum began protesting apartheid in South Africa in the mid-1970s and continued until the election of Nelson Mandela. In 1979, during a rash of disappearances of Atlanta’s African American youth, Lowery provided a calm voice to a frightened community. After becoming president of the SCLC in February of 1977, Lowery negotiated covenants with major corporations for employment advances, opportunities and business contracts with minority companies. He has led peace delegations to the Middle East and Central America. In addition to serving as pastor to several churches over the years, Lowery’s efforts to combat injustice and promote equal opportunities has led to the extension of provisions to the Voting Rights Act to 2007, the desegregation of public accommodations in Nashville, Tennessee and the hiring of Birmingham, Alabama’s first black police officers. After serving his community for more than forty-five years, Lowery retired from the pulpit in 1997. He also retired in January of 1998 from the SCLC as president and CEO. Despite his retirement, Lowery still remains active. He works to encourage African Americans to vote, and recorded a rap with artist NATE the Great to help spread this message. Lowery has received numerous awards, including an NAACP Lifetime Achievement Award, the Martin Luther King Center Peace Award and the National Urban League’s Whitney M. Young, Jr. Lifetime Achievement Award in 2004. Ebony has twice named him as one of the Fifteen Greatest Black Preachers. Lowery has also received several honorary doctorates from colleges and universities including Dillard University, Morehouse College, Alabama State University and the University of Alabama. Dr. Joseph Lowery, a leader of the Civil Rights Movement and one of the founders of the Southern Christian Leadership Conference, will speak Wednesday, January 17, 2006, 7pm, EUC Cone Ballroom at UNCG. He will be speaking during the UNCG Office of Multicultural Affairs Martin Luther King, Jr. Celebration 2007. The MLK Service Award will also be presented to a student, faculty or staff member on Tuesday. The Gospel Choir of UNCG’s student Neo-Black Society will also perform. Tickets are free and available through the UNCG Box Office. More information at UNCG Office of Multicultural Affairs site or at 336-334-5090.